With good credentials as the Professor of Psychology at UCLA, and director of the research network in youth mental health care paid for by the MacArthur foundation, Prof Weisz is responsible for authoring a "what to do" book about fear, anxiety, phobia, depression, attentional and conduct problems, the stuff of the practice of juvenile specialists. The book's organization is really its strength. The introduction covers the "lay of the land" in approaching children's mental health problems, and then the first section is, like the others, thematic, this time for fears and anxieties, and I like the split between the reality and the diagnostic entity here, arranged around case studies. Each section covers not only the case, but a discussion around the issues and the treatments. Section B, C and D, covering fears/anxiety, depression, and treatment for ADD and ADHD, each have two main sections which follow on a brief introduction to the pathologies involved. Section E is much longer, covering in 6 sections the panoply of behavioral and conduct problems, and Section F is devoted to a discussion of evidence based therapies, their strengths, limitations and future directions. So the structure is thus designed for learning, and this facilitation is the strength of the book as well as its focus on what might be best considered effective from an evidence based approach. Sections B looks at the four standard approaches to the subject of armoring against fear and anxiety, namely modeling, systemic desensitization, reinforced exposure and self-talk. Yes, I know it is systematic desensitization, but the proofreaders of the contents page missed that, skimming through as we do the not-important bits, but in the actual body of the book, no such silly slips are made, as Weisz takes this all seriously, as he should. For each of these approaches, he describes the processes used in detail which indicates that the book is pitched at those with little knowledge, a good thing for those of us who forget what the basics might be. He also summarizes the outcome studies in each field, and uses a hypothetical case and how one might use one of the four approaches to treat the child. Now I love windows which summarize, and so does Weisz, the window providing information on age groups, numbers of sessions, session lengths, participants, theoretical orientation from which the intervention springs, the steps of assessment, and the evidence for the efficacy. Very useful, both as teaching aid and reference, and very well done. Live, Symbolic, and Participant modeling techniques are discussed and evaluated, adding detail which is again most welcome, as is the ubiquitous trouble-shooting section, what to do when nothing happens or something does, but goes wrong. Each of the approaches is then applied to 'Sean' as noted before, and critiqued. It's just like being in the classroom. Its basic stuff, but this is misleading, as in my own experience in hospital settings and in outpatient clinics for anxiety and mood disorders is that these basics, such as not allowing avoidant behavior or teaching relaxation in reinforced exposure, is often forgotten, and treatments are often blended, losing their specific efficacy. A nice touch in this book is to separate the clinical from the scientific issues, most welcome in the eyes of many other authors, who are struggling and calling for a new humanism and morality to be infiltrated into the science, evidence based treatment approach, and this book negotiates the tension between these approaches with great skill, and more, with a good pragmatic approach. Other approaches, such as the Coping Cat, or Coping Koala for us Ozzies, and the F-E-A-R approach are also analyzed, together with the more family based approach to the Coping Koala. Depression as a target treatment is given similar handling in Section C, beginning with CBT for childhood, based on Stark's approach, with the same window-summary as before. As before, Stark's newer approach with increased therapist, and now the introduction of family time as well, is reviewed. In brief (buy the book if you want more of this complex but wieldy approach, or review Stark and Kendall's 1996 manual), affective education is followed by the identifying and scheduling of pleasant events (activities and mood are connected after all) and the seven steps of problem solving, from defining the problem to rewarding successful outcomes. Following on is an attempt to improve social skills and interpersonal problem solving, and then the alteration of maladaptive thoughts through cognitive restructuring. Self-instruction and self-control are then taught and then finally again, working with the family to create a context for all this change. A separate chapter deals with adolescent depression in the same vein, focussing on the coping with depression workshop approach, and as with 'Sean' previously, this and the last application of treatments is applied to a fictitious 'Megan' who is reportedly well on her way to thinking of Kurt Cobain as the messiah. Section D is devoted to the treatments for ADHD and of course as one would expect, this it a weighty part of the book, with multiple chapters. Behavioral Parent Training is the kick-off part of this section, dealt with in the same structural way, and focusing on Russ Barkley's Defiant Child Program for starters. There are no short cuts or jumps made her, and none elsewhere, but step by step instructions on session content and process are given over the next pages in protecting the child from the victimization of the prepotent response. Token, time out, all of these are common enough words, but so seldom practiced correctly, with lots of leeway built in which often derails the process: here, the detail is sufficient to allow for applications to have at least a good chance of success. Example is given of a daily school behaviour report card. Once again, outcomes are evaluated and now 'Kevin' is subjected to treatment. Similarly, in the next chapter (7 by now) behavioral programs are evaluated and described for classroom and for camp settings, as the 'difficult' child of the home spends most time away from it. Here, Barkley is swapped for Pelham, and the conceptual basis and procedural overview are dissected, and the by now ubiquitous methodology is followed with meditation over many of the aspects of this care. Section E: Conduct disorder and problems with conduct generally consume this last part of the book, 'Sal' is the kid in question, and the kick-off point here is the treatment of anger via the methodology of teaching anger control, a contentious subject at best. The first of the two is that of stress inoculation, reducing the impact of the antecedents of anger. Children may not recognize cues, and the failure to learn how to cope with what comes after the cuing. The social cognitive model from Lochman and colleagues is evaluated, dealing with attribution errors, distorted perception of interpersonal interactions, faulty emotion identification, restricted range to problem solving strategies, and maladaptive expectancies; hence the anger coping program revolves around this model. Windows again explain in brief both the stress inoculation and social cognitive model involved in anger coping. As with ADHD, behavioral parent training and family interventions are also evaluated, now in Chapter 9. The idea of social consequences acting as reinforcers a la Patterson and colleagues is the starting point for this chapter. Another pleasant aspect of this book overall is the emphasis on family and parent, and again in Ch 9. Here, the judicious problem selection paradigm is part of Patterson's approach, with specificity, neutrality, pragmatism, frequency, and choice are emphasized. Mention in the usual analysis is made of Chamberlain's fostering model, named Multidimensional Treatment Foster Care, which is described in detail, as Weisz tends to do: select something good, and explain in detail, rather than go fishing everywhere in the literature. Child non-compliance is dealt with in Ch 10, choosing now the Hanf model, with its various offshoots. Phase one involves differential attention, phase tow compliance training, with beta and alpha commands taught in detail throughout. Weisz is clearly choosing what works for him, which allows us to follow in his footsteps and evaluate what works and why, and troubleshoot when it all falls apart. Parent child interaction therapies (PCIT) are again looked at in detail, as before. The concept of parent training is taking still further, with video modeling and structured group discussion examined, starting with the incredible years BASIC training program, in 2-hour session lengths. Treatment steps here include constructive use of child-directed play, effective use of praise and reward, limit setting, handling misbehavior, and the other features, all summarized, and then explained in detail. Again Weisz has been selective, focusing on what he has found clinically useful, and promoting that. While the BASIC training imparts and supports basic parenting skills, there is more, and that involves SCHOOL and other video-supported programs such as ADVANCE, developed by Webber-Stratton. All of this is then tried with 'Sal', extensively, with windows of imaginary conversation, and details over many pages. The structure of the book is not only helpful, it's extensive and detailed; there is always a clinical versus academic/scientific section/discussion, and a troubleshooting paragraph. By Ch 12 we are looking at problem solving skills training (PSST) and parent management training for conduct disorder, dealt with as the other chapters are, and focusing on PSST, similar to what has gone before in Ch's 6&9; this draws on Spivack and colleagues 1976 work, and later adaptations by Shure in 1996-1999. Particularly, this was designed for problematic and even aggressive children, using a core of five problem solving skills. This is then combined with parent management training as developed by Patterson and colleagues, and then Fleishman and Conger, so there is a solid base again, and a two way focus again, both aiming at child and parent, or child and family, or child and school, so that the focus of pressure and change is not unilaterally directed at the perp, so to speak, but on the contextual interface, which is something I think is just not to be discussed, its just mandatory. With PMT, the child is kept in the loop, kept appraised, so there is no danger of the relationship being seen as collusion, and the child can shift some of the blame elsewhere and thus not feel labeled or set-upon. In keeping with this multisystemic focus, Ch 13 looks at just that, taking on the task of looking at the culture and background against which the child is to be seen embedded, and here we are talking of seriously damaged children with long histories which may include forensics. 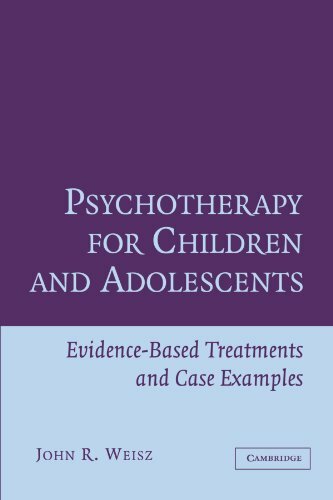 Reverting back, Ch 14 looks at evidence based youth psychotherapies, and the benefits and downfalls of each are again given Weisz's intensive analysis, and the further one reads, the more impressive the book becomes. If you are seeing kids and teenagers, there is just no point in carrying on without this book, and if you are into buying books for your ongoing education points, this is the one, if you buy no other. Weisz is to be congratulated on editing his way through the multiple approaches available out there, and bringing to bear his scientist practitioner approach to bear with great equanimity, favoring neither, and trying to bring out the best of both. Even for other cultures, the constant focus on the child, in combination with "the others" such as parents and schools, will allow for the necessary transcultural translations to occur without the pitfalls say, of other limited approaches which suppose a Western democratic family structure rather than another form of embeddedness or enmeshment more common elsewhere. I look forward to revisions of this book in future, and will buy them too.